Every S11 and S13 is carefully assembled at the VAIO headquarters in Azumino, Nagano Prefecture, Japan. Each VAIO notebook computer has to pass a stringent series of quality control tests before it can be delivered to the hands of customers. We named this particular set of procedures, designed to ensure the highest quality and standards, the “Azumino Finish”. It is the definition of how we pursue perfection at VAIO. The pursuit of perfection in craftsmanship and total quality, from start to finish. Located in Azumino, Nagano Prefecture, Japan, the VAIO Corporation prides itself as a notebook computer manufacturer with a relentless pursuit of quality. At its core, the VAIO brand stands for a wealth of experience in top-notch manufacturing, state-of-the-art technologies and dedicated talents with a passion for craftsmanship. 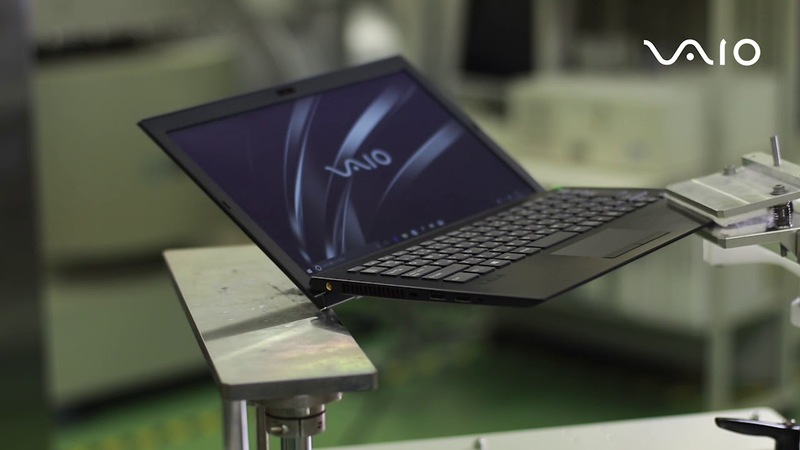 All VAIO notebook computers are either fully manufactured or assembled in Azumino, and can only be taken to the market after passing over 50 stringent quality control tests. The VAIO TruePerformance technology optimises CPU performances and is tested to improve the 8th-Generation Intel® Core™ processors by 11% to 13%. At its core, the VAIO TruePerformance optimises the architecture of the heat sink, thus maintaining higher performance for a longer period of time by increasing CPU power limits and more efficiently eliminating processor heat. The new S13 has a new cooler with thicker vent, a new fan system with higher heatdispersing capability and a new module design to ensure stable and high-capacity operation of the processor. The S11 and S13, which comes with a professional-grade PCIe SSD storage (with an M.2 interface), is six times faster than conventional SATA SSD. The new SSD offers a faster and crispier experience in launching applications, as well as reading and writing data. * VAIO test results. Actual performance could vary from test results due to differences in operating environment and conditions. * The 3 rd-generation professional-grade SSD is only available on models with storage capacity of 512GB or above. The 256GB model is equipped with the 3 rd-generation high-speed SSD. Graced with an attractive hexagonal design that encompasses the exterior and interior of the notebook, VAIO notebooks cleverly combine form and function in exemplifying its design DNA. Thanks to a hexagonal body design and over 50 different tests, VAIO notebook computers are not only a beauty in itself, but also highly durable and reliable even when subject to impacts. When the computer screen is opened, the keyboard is automatically tilted to reduce stress on the wrists. The delicate design reduces stress on your palms and wrists, creating a user experience with added comfort. The S11 and S13 are incredibly light, at 0.85kg and 1.06kg, respectively, and thin (15mm). It feels light whether it is held in hand or put into a back pack. The S11 adopts carbon fiber chassis, while S13 adopts magnesium alloy chassis. Both offers sturdy protection from all angles. It remains light in weight while offering the same stiffness, thus achieving the remarkable light weight of the S11 (at 0.85kg) and S13 (at 1.06kg). * Weights vary depending on configuration and manufacturing variability. While typing on a conventional keyboard generates an annoying 2KHz noise, the exceptionally crafted keyboard on the VAIO S11 and S13 successfully reduces typing noise. A specialized coating applied on the keyboard surface prevents smudges and streaks. The high abrasion resistance coating keeps the keys clean and clear for a long time. Convenient typing experience in a dimly-lit conference room or aircraft cabin. The backlit keyboard makes it easier for users to see the keycaps, offering a comfortable input experience that is not limited by the surrounding light environment. Gone are the days when you need to memorise your password to unlock your notebook computer. With fingerprint unlocking, your data security is significantly enhanced. The fingerprint scanner is compatible with Windows Hello and can sign you into the Windows operating system by means of a quick touch of a finger, with no scrolling required, making logging in all the more easier and secure. With battery life of up to 8 hours (S13) and 11 hours (S11), you can travel free of hassles knowing your VAIO notebook computer will always be available. The speedy charging feature will replenish around 80% of battery power within an hour’s charging. Even if you forget to fully charge your notebook computer before leaving home, you can always conduct a power charge within a short period of time. * Data on battery life is obtained from tests deploying internal tools by VAIO engineers. The actual battery performances could vary from battery life tests shown above, due to differences in operating environment and conditions. Slow network connection does not necessarily mean poor network. It can be a problem with the Wi-Fi signal reception. S13 has its Wi-Fi antenna installed at the top of the screen, the highest part of the laptop, to minimize interference, improve reception and ensure a fast and stable network connection. Compatible with LTE supported by carrier aggregation, creating mobile office experience. LTE model has built-in mobile data connection capability. Users can assess the internet with the laptop itself without the need of a Wi-Fi router or tethering from another device. The design also saves the user’s time and effort in switching between Wi-Fi and cellular networks. * LTE function is only available for specific models, please refer to specification for details. The new VAIO S11 and S13 come with a built-in HDMI port, a VGA port and three USB 3.0 ports, as well as an SD card reader, requiring no external adaptors during everyday use for data transfer and connecting to external display units. Via the notebook computer’s HDMI and VGA ports, the screen’s output signals can be simultaneously output to up to 3 screens, which is perfect for applications requiring extra screen displays, such as stock trading and graphic designs. * The USB port on the right side of the notebook computer can support power charging of mobile phones and tablets when the notebook computer is powered off. Each VAIO notebook computer has to undergo and pass over 50 quality tests in realising our pledge of durability to customers. We reassess and overhaul the design architecture our notebook computer, including conducting over 50 tests based on actual usage scenarios, before commencing production of a new generation of products. The S11 and S13 are equipped with anti-spill keyboards. These laptops were tested to be able to continue normal operation for a period sufficient to complete data storage, even after 150ml of water was spilled on the keyboard. * In the event of a water spillage, users should wipe away the water, before bringing the laptop to a VAIO service center for inspection or repair. * The anti-spill feature is only available on the keyboard and is not applicable on water damage to other parts of the laptop. The pen bend test is carried out to simulate an alien object, such a pen, is caught between a notebook computer’s screen and keyboard when closed. A user’s data could be better protected if the notebook computer’s mother boards and other hardware are not damaged under this scenario. A pen (with a diameter of 10mm) is placed between the screen and keyboard, before the notebook computer is closed. The test is repeated with the pen being placed on the left and right side of the computer, before it is closely examined to ensure that the chassis is well protected. Solutions to prevent and minimise damage to the screen and its rims were developed thanks to such tests. Considering the risks of unforeseen damage to a laptop inside a computer bag, efforts were made to ensure that the notebook computer is sturdy enough to withstand impact. The risk of your important data being damaged or lost can be reduced if the components and screen of a notebook computer can be protected during an impact. During impact tests, the VAIO notebook computers are dropped on all six sides, at preset angles from 90cm. A notebook computer can be deformed and parts could be sent flying if its casing is not sturd enough to withstand the impact from a drop. After each drop test, we carefully examine all parts of the notebook computer to improve our design for maximum protection of user’s data. VAIO laptops are robust and built to last, even under pressure and vibration. Imagine yourself carrying a laptop inside a crowded train compartment during peak hours, the screen, keyboard and the body unit of the laptop could be under serious pressure like a hard squeezed sandwich. 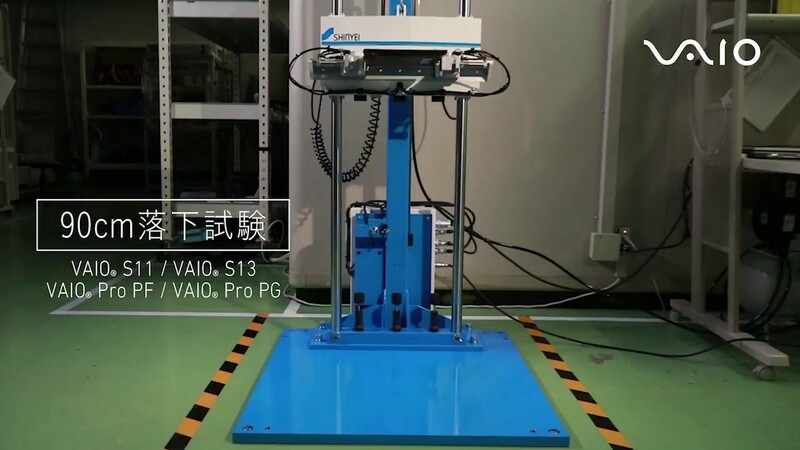 During pressurized vibration tests, a VAIO laptop was tested for functionalities when a 150kgf* pressure was applied to it. Although boasting an ultra thin casing, VAIO laptops were tested to be sturdy under extreme conditions. * kgf is a gravitational metric unit of force, equalling to the magnitude of the force exerted on one kilogram of mass under standard gravity. VAIO laptops remain sturdy even after receiving repeated impacts on the corners. 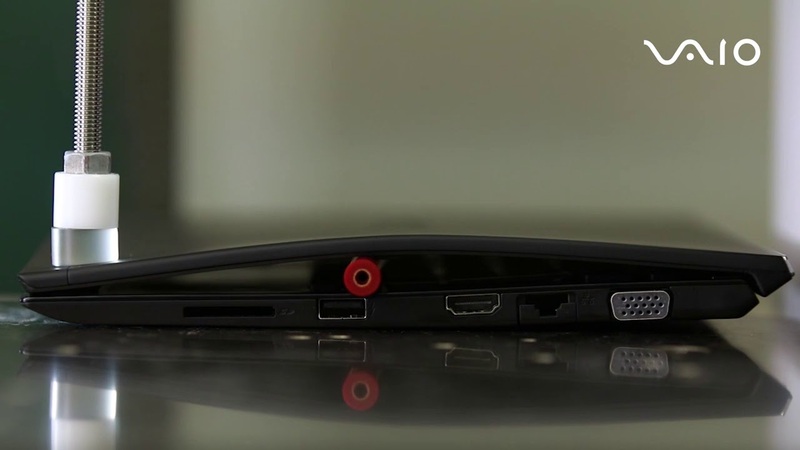 One could make the corners of a laptop hit the desk by placing it on a surface single-handedly. 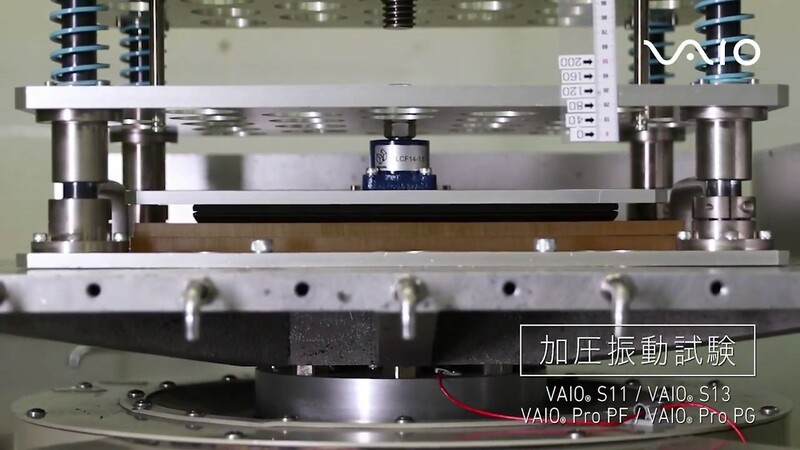 During corner impact tests, all four corners of a VAIO laptop was simulated to have received impacts by placing it onto a desk surface from a height of 5cm for 5,000 times. Although the impact is relatively small each time, the damage can still be significant given the sheer number of impacts. VAIO laptops remains study and durable under repeated and prolonged corner impacts.